Welcome to ParcelFriend! 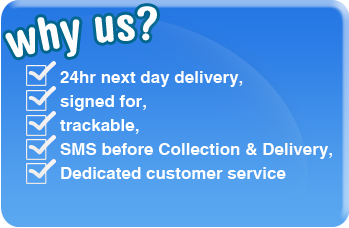 Courier services, Parcel Delivery within minutes. Ship to UK, Belgium, France, Germany, Luxembourg, Netherlands, Republic of Ireland, and Northern Ireland, Austria, Denmark, Switzerland.. Get a quick quote now! Our parcel delivery services includes many free premium features that are not available in other parcel delivery companies and that of which makes parcel sending easy to use. These features range from SMS notification with a parcel delivery window of 1 hour when the driver will be ready to collect or deliver your parcel(s). Here at ParcelFriend.com, we have a wide range of 24hr Parcel Delivery courier services to offer our customers. We have a UK & EU parcel delivery service. We have an effective parcel sending delivery booking system that chooses the best couriers which suits the shipment, from light weight to heavy shipments. Our parcel delivery network has over 2000 delivery, collection depots in the UK and EU. Please feel free to contact us, if your need help or have any enquiries with parcel sending regards to any of our parcel delivery courier services. We are pleased with our ongoing. parcel delivery next day parcel sending delivery service we have offered so far and we are always working hard to getting the best competitive price possible. Our UK parcel deliveryservice covers 95% of the UK and we will collect / deliver your parcel via a next day delivery service. Our European (EU) parcel delivery courier service has five zones.